OK, so despite the cost of gas the family is taking a road trip. Or, you’re all at the airport suffering through a seemingly endless flight delay. Or, the power is out, the batteries have run down, and your kids are desperate for amusement. Or, a rainy afternoon makes it just the right moment for some quality time together. These are the times when you need to have a bag of tricks at the ready — ideas, activities, and games that are both portable and engaging. Perhaps something old-school – no battery pack, no power source, no taps. Consider a deck of cards. Yes, a deck of 52 same-sized pieces of stiff paper decorated on one side with black and red numbers and pictures. 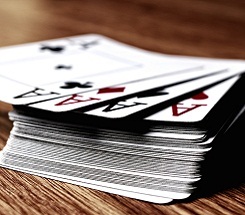 You might be surprised at the wealth of entertainment — and learning — a deck of cards can provide. A thousand years ago, when neither my father nor I had white hair, he taught me a game called Cassino. I’ve since learned that the game (sometimes spelled Casino or Kasino) traveled across the Atlantic from western Europe in the late 19th century and is played with one or two variations in Finland, Sweden, Swaziland, and South Africa. But let’s not get caught up in history, as interesting as it may be. To play, my father gave us both four cards. He then placed four cards on the table face up and put the rest of the deck aside for use later in the game. Right or wrong, I always got to go first (thanks, Dad). For my turn, I could use a card from my hand to perform one of the following actions: a) capture two cards from the table, b) create a “build,” c) take another card with the same numeral or picture, or d) just lay the card face-up on the table. Here’s how a capture works: Say I had a 6 in my hand and a 2 and a 4 were on the table. Since 2 and 4 add up to 6, I could capture both cards with my 6 and put all three in my pile. Here’s how a build works: This time, say I’m holding a 2 and a 6 and there’s a 4 on the table. I could put the 2 on top of the 4 and saying, “Building 6.” On my next turn I could capture the 2 and 4 with my 6. Of course, if my dad also had a 6, he could capture my build, and I would get nothing for my effort. Play would continue until my dad and I each used our four cards. Then he would deal us four more and we would go again. When all the cards had been played, we would add up our points according to a particular system. Whoever racked up the most points won. Of course, at the time I had no idea that there was anything school-ish about Cassino. As far as I knew, it was just a fun card game I played with my dad. But in fact, I was ciphering and strategizing. When my own kids “came of age,” I taught them Cassino, but with a twist: We would create, capture, and build chain problems, and we would use subtraction, multiplication, and division as well as addition. Suddenly Cassino became an arithmetic challenge, and I had to get used to losing! More recently, I’ve come to appreciate just how entertaining 52 cards can be. For example, turn over any four cards and see who can use addition, subtraction, and multiplication to come up with the biggest number — with each function used only once. Turn over five cards, and add division to the mix. Then modify the game to see who can come up with the smallest number. Change it again to include negative numbers. Play “Guess the Number,” a game that involves picking a card from a deck and giving or getting clues to the number, all neatly tailored to each player’s ability, For instance, 6 can be the product of three twos, the difference between 81 and 75, the square root of 36, or the number of faces on a cube. When your kids were babies, you probably traveled everywhere with a bag filled with diapers, toys, and dry cereal. Now that they’re older, perhaps your bag of tricks should include a deck of cards.